Click here to view their Operating hours. The Alaska Zoo is a zoo in Anchorage, Alaska located on 25 acres of the Anchorage Hillside. It is a popular attraction in Alaska, with nearly 200,000 visitors per year. The zoo is currently home to more than 100 birds and mammals representing some 50 species. The zoo has the widest variety of animals native to the state of Alaska as well as some exotics such as Siberian Tiger, Amur tigers, Bactrian Camels, and yaks. In addition to viewing, the zoo specializes in education, research, wildlife conservation, and animal rehabilitation; many of the animals currently in the zoo were found orphaned or injured. Click here to sign up for weekly newsletter. 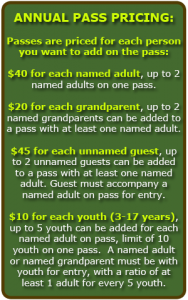 Why purchase an annual zoo pass? Zoo passholders play a very important role in supporting the Alaska Zoo as a private non-profit zoo. Pass purchases goes toward animal care, exhibit renovations, and education program growth.